Earn $40.21 in Rewards credit. Click to learn more. Work horse / Race horse. Shimano's Dura Ace C24 Clincher is the one-wheelset quiver option for many a racer around the globe. The 9100 model remains structurally unchanged from the tried-and-true success of the 9000, using a carbon/aluminum hybrid rim with a standard aluminum braking surface leading into a half millimeter thick section of alloy, which is then reinforced with a carbon fiber layer on the exterior for excellent stiffness and low weight. The C24 rim has an 20.8 mm width to optimize the tire contact patch and aerodynamic performance, with 21 mm / 24 mm front / rear depths providing steadfast stability in the crosswinds. At the center, angular contact ball bearings in the hub are smooth and dependable, and they've been made even easier to adjust thanks to the tool-free "digital click" system so you can put the cone wrenches back in the tool box. Oversize A7075 alloy axles are incredibly rigid yet lightweight, and a wider rear flange spacing furthers stiffness even more. A full titanium freehub body shaves a few more grams while offering great wear resistance. 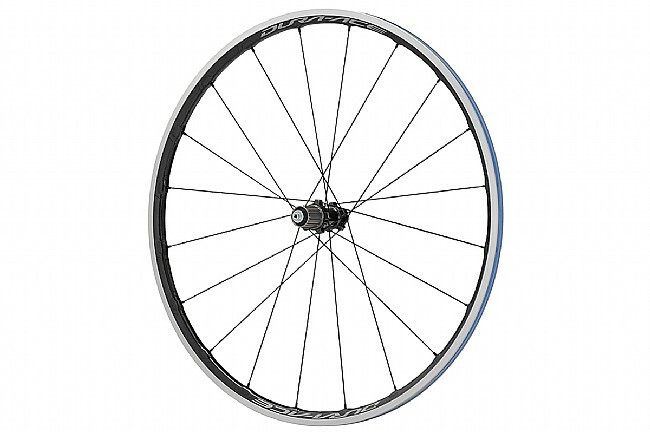 The Dura Ace WH-R9100-C24-CL Wheelset is compatible with standard clincher tires. Quick release skewers are included. For use with Shimano/SRAM 8/9/10/11-speed cassettes. Claimed weights are 593 g / front, 819 g / rear, 1412 g total.